FL-27: Polling is showing Donna Shalala lagging behind in what should be an easy Democratic pickup. FL-GOV: Ron DeSantis doesn’t really have a health care plan. GA-GOV: The Georgia NAACP is getting ready to sue Brian Kemp over his office’s reported hold on tens of thousands of voter registration applications. 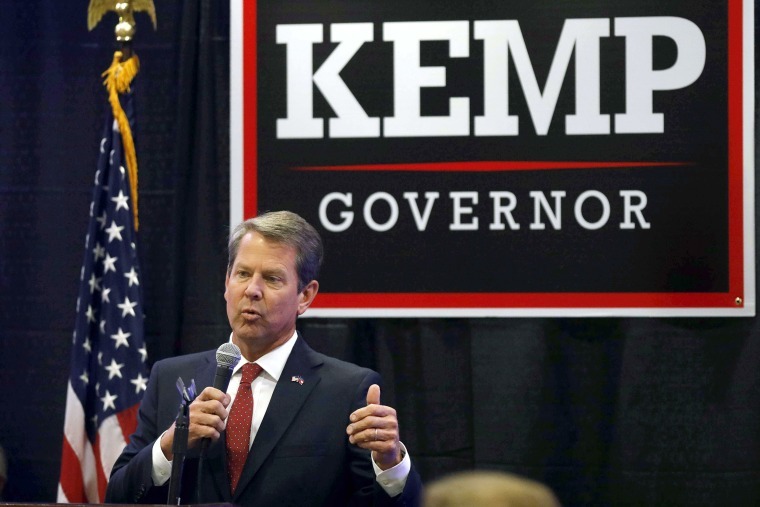 And the Abrams campaign wants Kemp to resign from his job as secretary of state. IA-3: Cindy Axne and David Young clashed on health care and taxes in a debate last night. ME-GOV: The New York Times has the scoop on a 2006 discrimination claim against Shawn Moody. MI-GOV: Bernie Sanders is endorsing Gretchen Whitmer. OH-14: The Wall Street Journal notes that Dave Joyce is one of just two House Republicans who have aired TV ads about standing up to Trump. TN-SEN: The NRSC is invoking “Mob role” in its latest anti-Bredesen ad. Some volunteers are not happy with Bredesen over his endorsement of Brett Kavanaugh. The expansion of broadband is becoming a big issue in the Senate race. TX-SEN: Another new poll has Cruz up comfortably over O’Rourke. Is the press going overboard with Beto coverage? WI-GOV: Here’s our NBC/Marist poll of Wisconsin’s Senate and governor races. Why did that poll look a little different than Marquette’s? An explanation. Turks have told U.S. officials that they have recording that prove Khashoggi was killed, writes the Washington Post. Trump’s lawyers are preparing answers to Robert Mueller’s questions. Here’s NBCNews.com’s wrap of the whole Kanye thing. The Washington Post notes how critics of how Obama invited celebrities to the White House still praised Kanye West’s appearance. Dina Powell has taken herself out of contention for the U.N. ambassador job. Michael Cohen is now a registered Democrat. Keep an eye on the Wilbur Ross Census story.